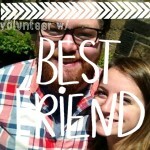 Recipient: The Women’s Lunch Place, me (I mean I got to hang out with CA). 4. 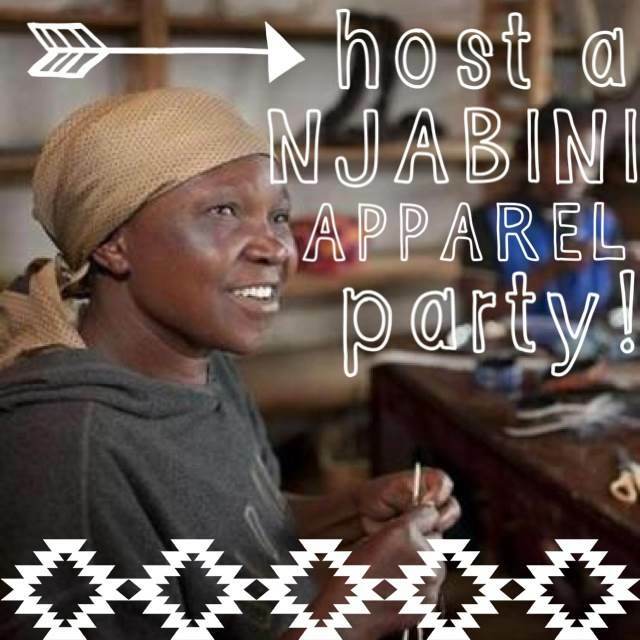 Host a Njabini Apparel party. I’m sure you’ve noticed Njabini pop up on this blog a couple times (like here, here, and here, for starters). It’s one of my favorites, and well-known at Northeastern. The clothes are very cute—sure—but it gets better. 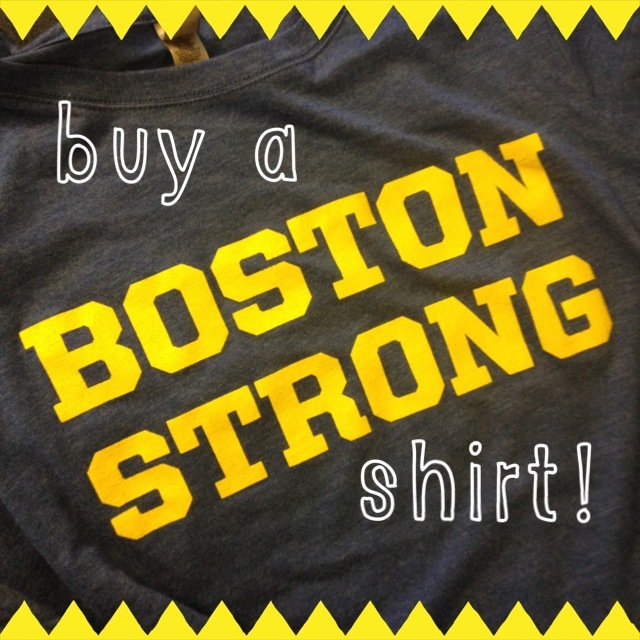 The money goes towards paying mothers in need, supporting local Kenyan economies, and a wide variety of do-gooder awesomeness. Anyway, they are able to host in-house sales parties (like Tubberware, or Creative Memories), so naturally I’m all signed up. I’m going to stock up on some cheapo wine, savory cheeses, and yummy sweets—a wide array of girlie treats—and then invite my fellow fashionistas over. 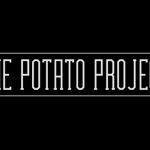 It’s fashion meets food meets charity in a fabulous trifecta of awesomeness. You know you want an invite. Recipient: Njabini Apparel, fashionistas, me (I mean, I get company and food and will inevitably buy myself something classy and fabulous). 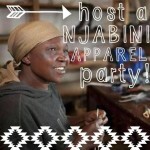 2nd UPDATE: If you’re interested in hosting a party, contact them at: Mike[at]NjabiniApparel[dot]org. 5. 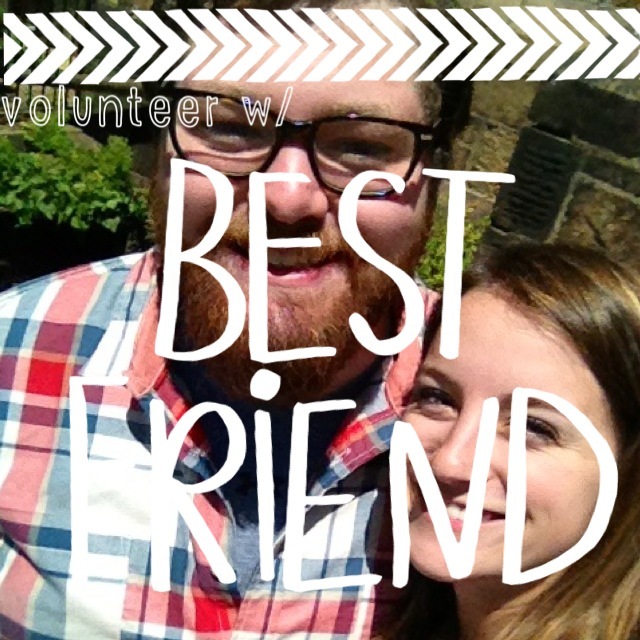 Volunteer with Hope Lodge. This one comes from Kappa, as well. Kappa Kappa Gamma’s philanthropy program is broken up into three parts: (1) Reading is Fundamental, (2) The Kappa Foundation, and (3) local charities at each chapter’s discretion. 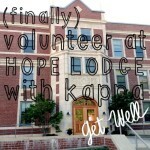 My chapter’s “local” component is Boston’s Hope Lodge. It functions similar to Ronald McDonald House(s). 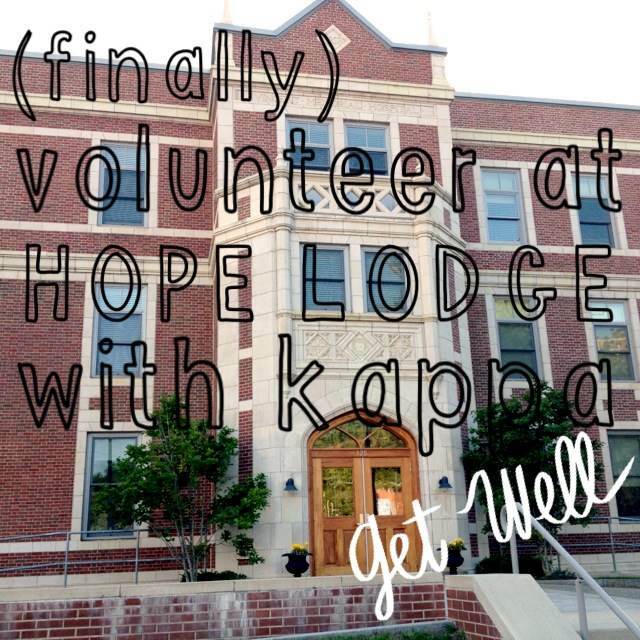 The lodge is open to those who are sick and any family members that need to stay in Boston and are from too far away. 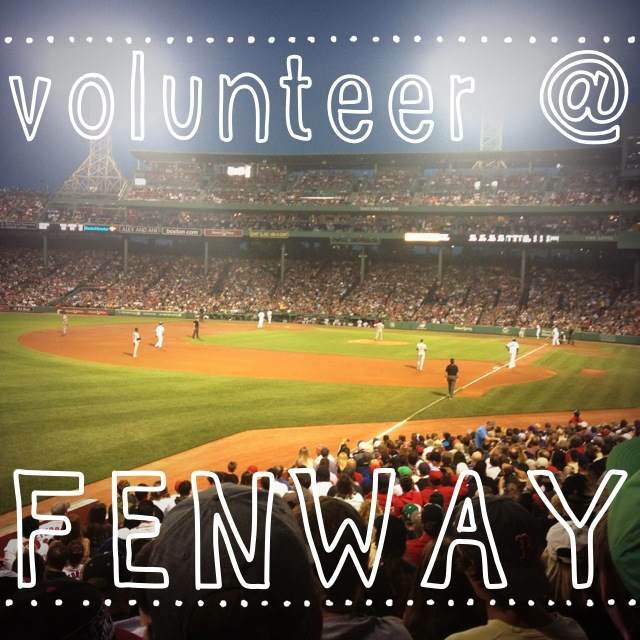 They’re provided living areas, a wonderfully equipped kitchen, and a sense of community just blocks from Boston’s hospitals. Kappa goes many times each month to provide conversation, games, and a little TLC to the residents. Only, it’s always scheduled when I have work or class. But it was on my bucket list and on this list so I made it work! 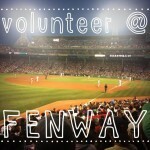 Recipient: Hope Lodge Boston, me (I mean, I get time with my sisters and the opportunity to meet wonderful people). UPDATE: It was so much fun! We baked the residents cookies and played BINGO for two hours. There are worse things, right?? 6. Collect and donate clothes to Goodwill. I grew up with a “Goodwill bag” in my garage; whenever something was too big, small, awkward, whatever, it went in the bag instead of the trash. 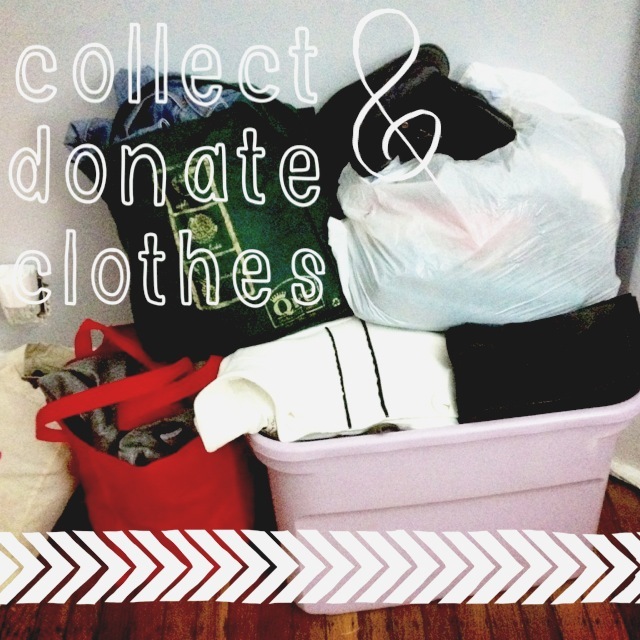 I love Goodwill, and all clothing donation programs, mostly because they’re such an effortless way for people to help with minimal personal cost. I reached out to my Kappa sisters and friends and collected tons of clothes and goodies—it was timed perfectly as people were moving and downsizing their belongings, switching out their winter wardrobes, and shedding extra “weight.” The picture doesn’t do the end product justice; I ended up driving over a full car load—we’re talking trunk, back seat, and buckled into the front seat. A special thanks to everyone who donated. 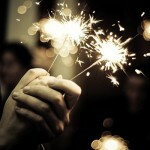 I’m so happy I could take the “burden” off your hands and turn it into something wonderful! The guy at the collection site was so grateful. 7. 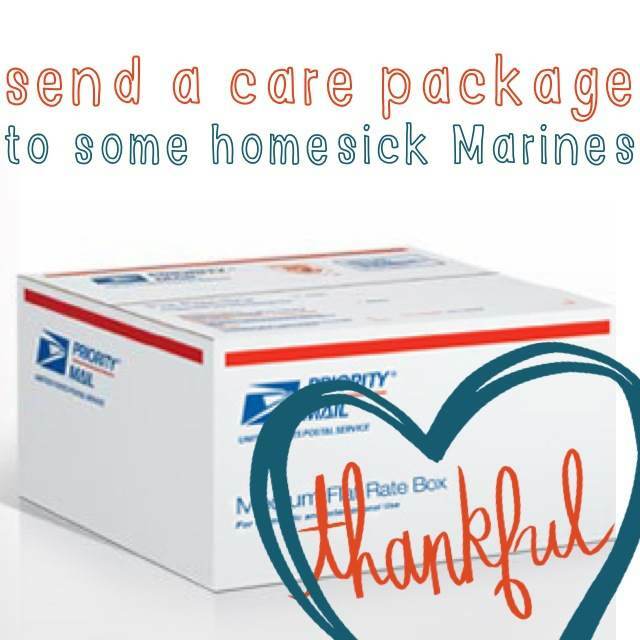 Send care packages to Marines. I’m still working on this one, but while I was collecting clothes for Goodwill, I also requested non-perishable food, batteries, and general “goodies.” The donations were great (I mean, who wants to pack and move a half-full box of single-serving oatmeal?) and I have a couple boxes of stuff—cheers to whomever donated the frisbees. Our boys (and girls) overseas will be so appreciative! I’m going to go through the website AnySoldier.com which allows you to sort recipients by name, hometown, etc. Recipient: Marines, me (I mean, I could get potential pen pals out of this!). UPDATE: I’m putting together a box and decided to send it to a small group (6) of Marines currently stationed in Afghanistan. I’m including a letter and a picture of my sorority—hopefully we hear back from them! 8. Bake goodies for my coworkers at NECN. 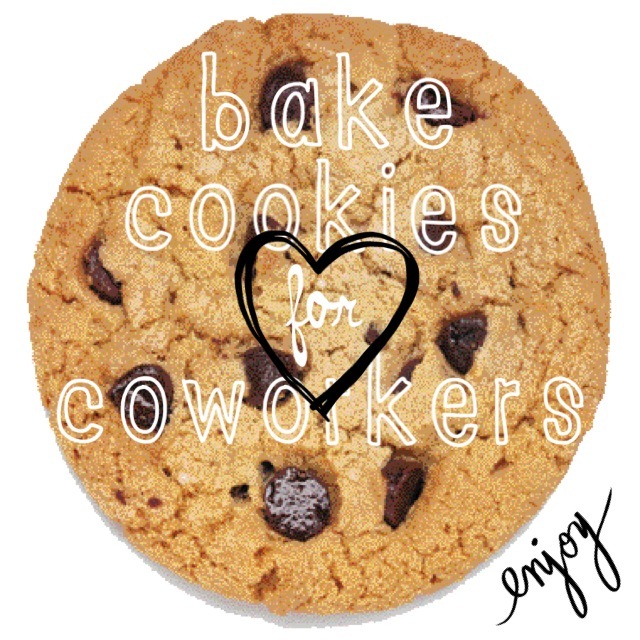 I did this on my birthday week and the cookies were gone before I left the office to go shoot. There’s just something about hunting for news stories that makes us lowly journalistas so famished. At my old co-op, I used to bring in goodies because I faced a wall, and it was a fun way to ensure I got to meet everyone and didn’t spend my days conversing with “Thor Lady” (a true, but kind of long story) and my cubicle decorations. Then, I made things from scratch or bought strawberries… the joys of having money. This time I got the break-and-bake variety. Still were delicious. Recipient: My hungry journalistas, me (I mean, I had one or two). 9. 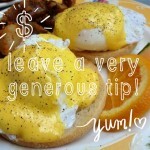 Buy a meal for someone in need. In Boston (and New York and Paris and any city ever), I get bombarded quite a bit by people begging for spare change. They hang out on street corners, benches, wherever… I’m actually not sure why I’m explaining this because it’s not a foreign concept. ANYWAY, I seldom give anything because I (perhaps wrongly) assume they will spend it on cigarettes or booze or whatever. I also seldom carry cash. However, I am more inclined to offer to buy them something to eat, especially if I was on my way to make a purchase anyway. During one instance, I offered and the guy asked for Gatorade so I bought a nice big bottle and also picked up a wrap that would keep for a bit in case he didn’t need it right away. 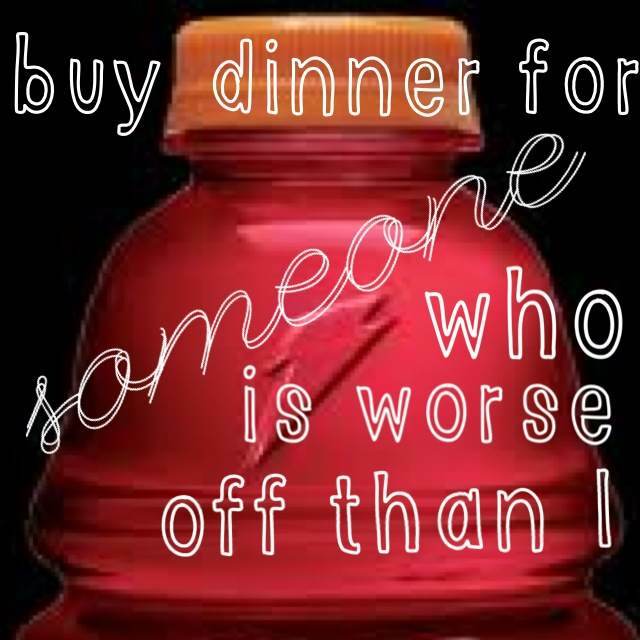 Though expensive, it felt good to help someone out—I mean, who doesn’t like Gatorade? 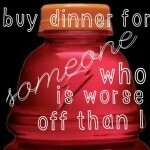 Recipient: Gatorade man, me (I like good karma!). 10. 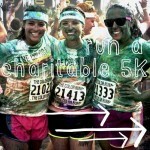 Run in a charitable 5K. I’m heading up to Maine the Fourth of July weekend for a fun 5K—This one is another double whammy. 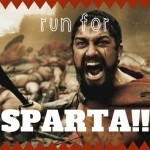 It was on my bucket list this year to do some sort of “theme” run (zombie, spartan, etc.) 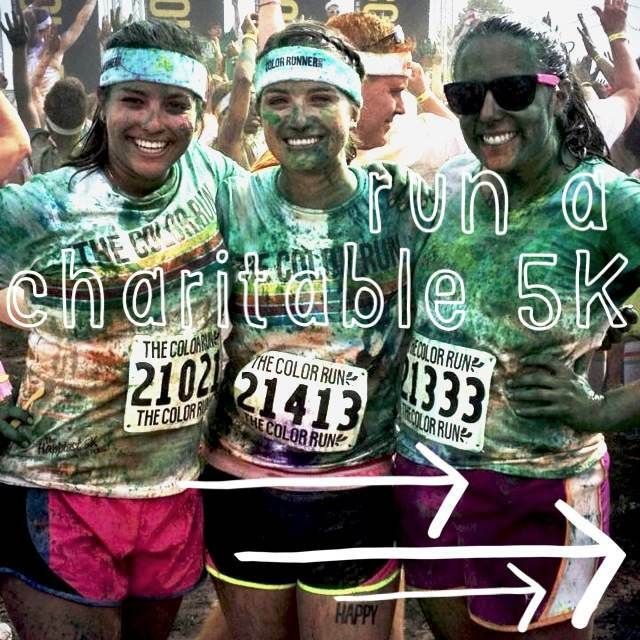 and I signed up for the color run that weekend in Portland, Maine! Basically, over the course of 3+ miles, people through colored powder at you and you cross the finish line looking like you took a bath in tie-dye, or Kool-Aid, or whatever. I’m going to be so darn colorful and get chalk all over the car, then go play on my friend’s boat. And as a topper, the proceeds from the application/processing fee benefit the Barbara Bush Children’s Hospital at Maine Medical Center. Can’t really beat that! Recipient: Barbara Bush Children’s Hospital at Maine Medical Center, me (I mean, my cardiovascular health will thank me!). UPDATE: The Color Run was so much fun! We ended up doused in green powder (seriously—green boogers, green highlights, green armpits…). 11. 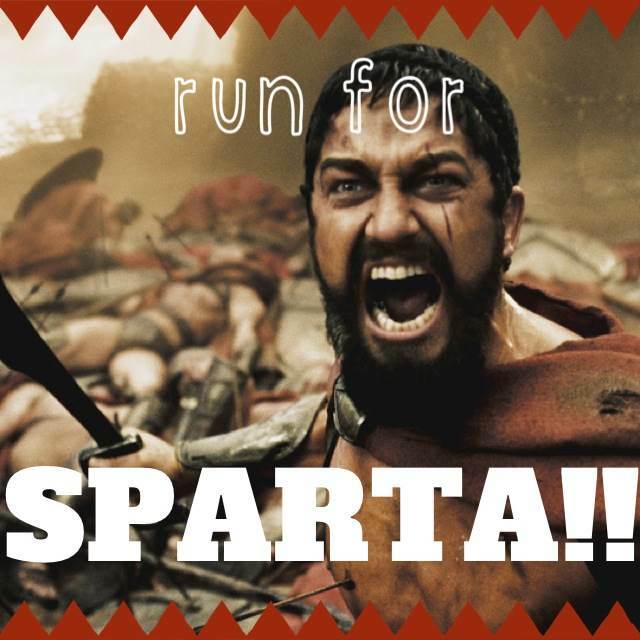 Run a Spartan Race. I’m a little bit cheating because this could be crammed together into the last category, but the Spartan Race is an accomplishment in itself, so here’s hoping! Basically, it’s a race with a bunch of different obstacles and challenges—only every race is different, so you’ll never know what you’re going to have to face. It forces you to be resourceful, athletic, and a team player. I’ll be going with my friends Pitu and SpeedBump and I think we’ll have tons of muddy fun. Plus, there’s beer at the finish line (Yay, 21!!). Recipient: Homes for our Troops, me (I mean, I get to run around in the mud and drink beer). 12. 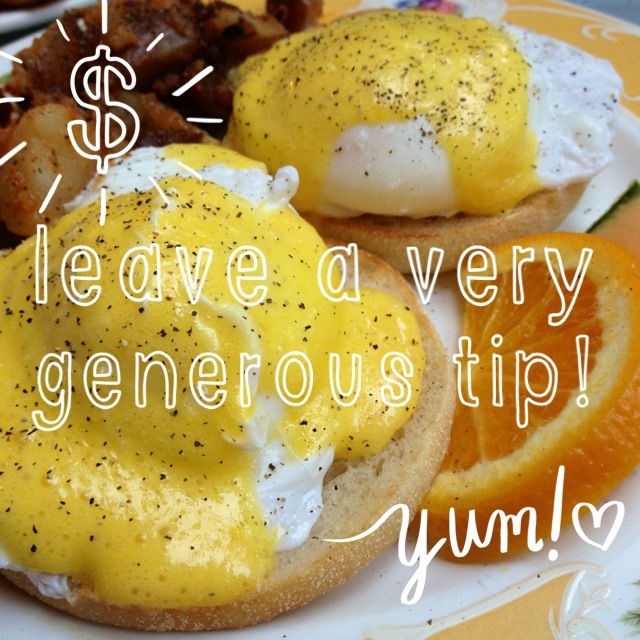 Go to birthday brunch and leave a generous tip. This one was a little rough, given that I went to brunch on my birthday and had spent much of the night before bonding with the toilet… but what good is a 21st birthday without a little life lesson thrown in? Anyway, I met with my amazing little and she took me for brunch at a little place nearby named Thornton’s, under the condition that I pay the tip. Thornton’s is super cheap (relatively speaking) so I was super generous with the tip without feeling as sick as I had the morning before 🙂 And a super, super bonus? She surprised me with a full-body massage on Newbury after. Best. Little. Ever. Recipient: Some not-super-smiley waitress at Thornton’s (cheer up, yo!! ), me (I mean… breakfast, massage, potential smile out of grumpy waitress). 13. 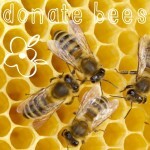 Donate bees, chicks, or livestock. My mother is a little bit of a hippie, and I love her for it. I grew up with weekly CSA (Community Supported Agriculture… it’s like buying into a farm and in return you get weekly organic crops) and a worm compost bin. We grow wine grapes and have a fruitful garden (props to Pops!) and recycled before it was cool. Anyway, my mom has tossed around the idea of being more self-sufficient by owning chickens or bees or whatever. But sometimes that’s just not feasible. We have coyotes, for starters, but my mom also despises bees, so far as I know (the first time I ever heard my mother use the F*bomb at someone/thing). Anyway, instead I thought it might be cute to donate a hive of bees or a chicken to a needy family through Heifer International (check them out!). To them, the insects/livestock provide consistent income, and they can be bred to pass on the means to another family! Props all around. Recipient: Heifer International, needy family, my mom, me (I mean, this is freakin’ cool, come on). 14. 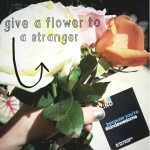 Give a flower to a stranger. This one wasn’t originally on the list, but I couldn’t resist when the opportunity was—quite literally—handed to me. I was walking past the Prudential Center when some crafty people from KIND snacks handed out granola bars and flowers, under the condition that we give the flowers away. So naturally the two guys I was with gave me their flowers (lazies), and I, in turn, gave three flowers out to a group of girls sitting together, wishing them a good day. They were so happy! I usually feel like it’s awkward to give strangers things, but maybe I should just walk around with some flowers more often. Recipient: three beautiful women, me (I mean, I got to receive the flowers and gift them away. It’s like re-gifting, only better). 15. 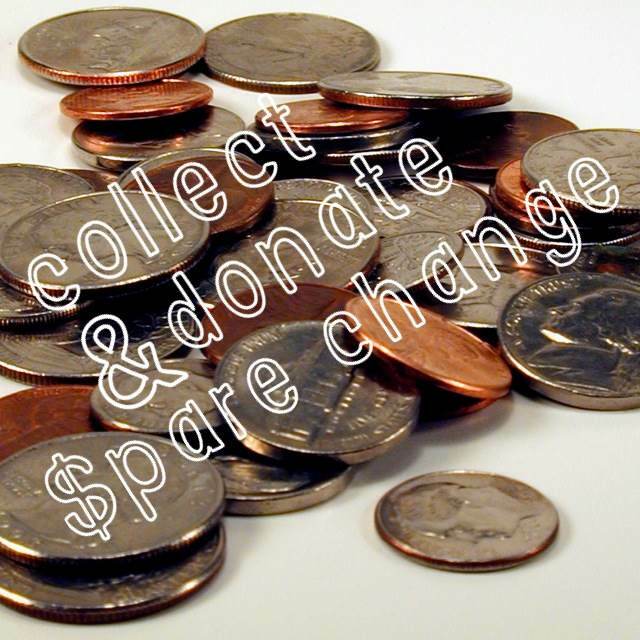 Collect spare change, and donate through Coinstar’s Coins that Count program. I recently learned that Coinstar has a donation option, so I’ve been saving up all my spare change (which I tend to hate anyway, unless I’m wearing a jacket, in which case I keep a few coins in my pockets because I like the weight of them in my fingers… I’m weird, I know). 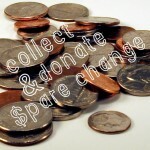 At the end of the summer, I’m going to take all my spare change (which won’t amount to much, but I’m trying! 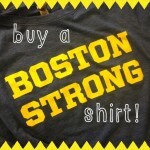 ), and donate it to one of their numerous charity partners. 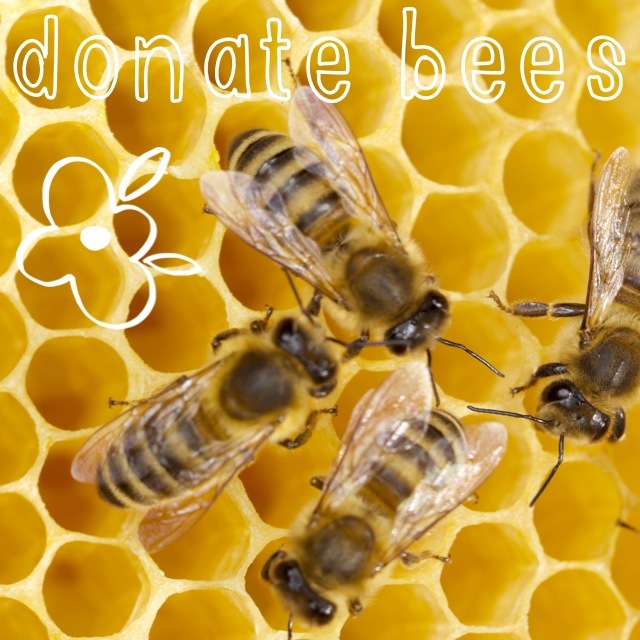 They have thirteen charities ranging from wildlife preservation to the Red Cross to Leukemia research. I’m stuck, but feel free to weigh in! Recipient: one of Coinstar’s 13 charity partners, me (I suppose there’s a tax write-off, right??). 16. Put change in someone’s meter. Speaking of dollars and cents and charity (oh, my! 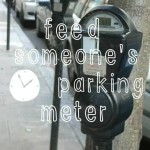 ), I have been keeping my eye out for expired parking meters that don’t yet have tickets. As a fellow Boston driver, I can attest to the frustration and frequency of parking tickets, and I know some people just get carried away and forget. So… I’m making an effort to keep a couple of quarters in my pocket, just in case I find the opportunity to help someone out a little. A little good car karma couldn’t hurt? Recipient: fellow Boston driver, me (I mean, I get that good car-ma, right?). 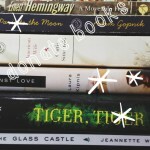 I love books… like, a lot. And I love having books, the idea of being surrounded literally by all the world’s best memoirs and love stories and fairy tales (and murderers and pedophiles and stories of almost dying). Books are beautiful, sophisticated, and they smell amazing. But they’re also really heavy, and I move every 6-ish months. Ever since I bought a kindle, I have managed to keep my book hoarding to a minimum—no easy task when I work in publishing and free books are everywhere. Some of those freebies managed to stick with me, and though they’re beautiful, I decided to de-clutter a little and I’m donating them. 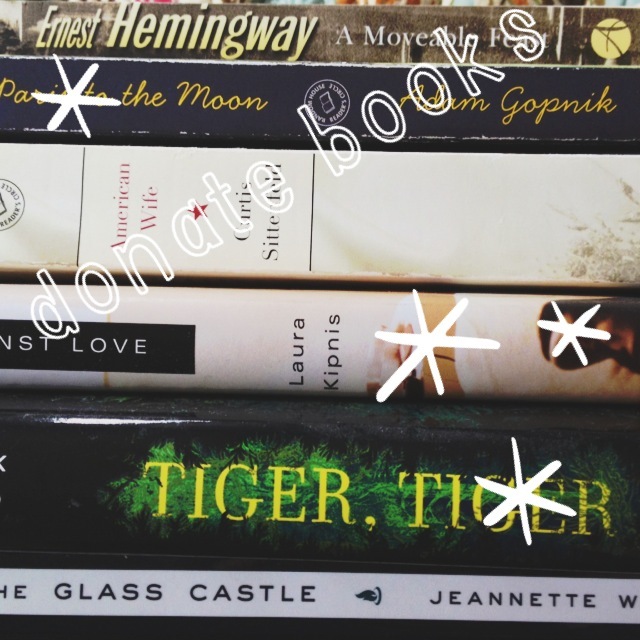 While I tossed around the idea of donating to Goodwill, Massachusetts jails, or local libraries, I actually ended up donating them to my sorority (our charity is Reading is Fundamental). While this sounds self-serving, they’re the same girls that helped me collect clothes and goodies, so I am happy to show my appreciation and some great stories with fellow 20-something girls whom I know will also relate! 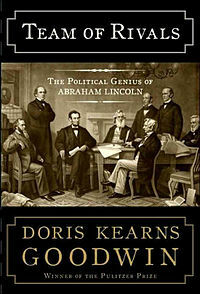 Recipient: my fellow Kappas, me (I mean, it’s like forming an informal book club!). UPDATE: I also found this organization which has book donation containers all over the city, and will come pick them up right from your apartment! 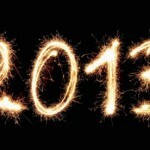 18.Reach out to someone special (and a little bit out of touch). I used to write letters all the time to my friends, but things get busy, people move and get jobs, and go on living. Sometimes, they pack up and move to Texas and you find yourself missing their guru-like guidance and general good mood. While I can’t hop on a plane immediately, I can reach out and let the people I care about know that I’m thinking about them. While I was picking out the glittery card pictured, I also picked up an inexpensive pack of thank you cards, and have been very diligent this whole summer about showing my gratitude when people go out of their way to do something extraordinary. Plus—everyone likes getting real snail mail in their mailboxes. 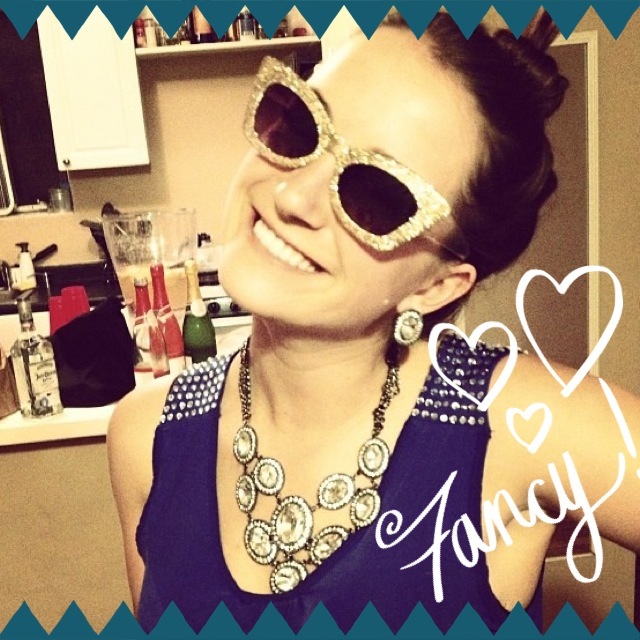 Recipients: My Houston hottie, me (I mean, I got an immediate thank-you text!). 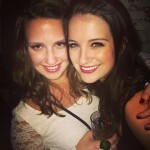 This entry was posted in bucket lists, musings and tagged #21for21st, birthday, charity by Marian. Bookmark the permalink. 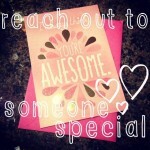 One of 18 reasons (so far) that I think you are incredibly cool!